Will here with Grizzly Outfitters on the river, a plug of mud moved through the Gallatin below Taylor’s Fork yesterday and last night but it’s clearing up quick. There is still a greenish tint to the river near big sky but plenty of visibility for some nymph fishing. Try a black stone fly with a goomie worm dropped of the back and you’ll find fish. The river should be clear enough for dries by the afternoon and there are certainly a lot of bugs to chose from. Caddis, mayflies and a few yellow sallies will be the main ticket items to look for but you may be surprised with a larger drake or even some late hatching stone flies! Don’t be afraid to fish a larger parachute, think size 12, or even a smaller stone fly like a size 12 purple chubby. Keep your eyes peeled for the spruce moth!! You can never be sure when this terrestrial will make it’s first major appearance but when it does you’ll want to be ready! You know how your grandma says you’ll know immediately when you’ve found “The One”? She was right. It took only a few turns and I fell deeply in love with my DPS Yvette 112RP carbon skis. DPS – Heard of them? Yes, smart guy, I’ve heard what you think DPS stands for. Thanks for telling me anyway and grossing me out on the chairlift. I don’t know you and it’s creepy. In 2005 pro skier/ski designer Stephan Drake joined forces with ski engineer Peter Turner and DPS was born. It stands for Drake PowderworkS, and the company seeks to “create the perfect skis worthy of those who live and breathe the sport”. DPS is known worldwide for its trailblazing technology, shaping, and durability. They are the world’s only company to create a “Pure prepreg carbon fiber sandwich ski”. Their Pure3 skis are manufactured at their factory in Salt Lake City. Made in the USA! If you don’t recognize the name, I bet you’d recognize the skis. In contrast to the industry standard, DPS has chosen solid top sheets in optimistic colors with minimalist logos. They stand out in both looks and performance. The Pure carbon Yvettes are HOT pink, and just looking at them makes me happy. It’s not just their shimmery unicorn candy heart color, but for their shape and feel. I’ve always been more tomboy than princess – but these Pure carbon skis are beauty and beast. DPS doesn’t dumb down the technology and slap on a pretty top sheet for the ladies. The Yvettes are based on the geometry of the acclaimed DPS Wailers: 141/112/128. The tip rocker is 480mm, which enables the Yvettes to shine in the powder. They’re responsive and do well in a variety of snow conditions. Confession, I should admit that I telemark. I’ll wait while you tell an out-of-date telemark joke. Haha, done? I think I rode the chairlift with you earlier. I mounted my Yvettes with TwentyTwo Design’s Axl bindings. It’s my dream set up. The Yvette 178cm weigh 1700 grams, or 3.75 pounds each. My Axl bindings (small) weigh 1.9 pounds each. SO combined they weigh 5.65 pounds, which is less than a six-pack. They’re so light that in contrast it felt like there were no skis on my feet. DPS pioneered the carbon ski technology utilized at its Salt Lake factory. Similar technology is used in jet fighters and spacecraft. The prepreg carbon used by DPS is spawns freakishly lightweight, torsionally stiff skis. My Yvettes float like a dream in the pow, bust the crud, and carve the corduroy. Ideally we would all have an assortment of skis for different conditions. But if you have to survive with one pair, this would be my pick. Don’t believe me? Demo a pair 3/21 at Big Sky Resort from 9:30am to 3:00pm, or swing in to Grizzly to check them out. Off-season is upon us here in Big Sky. After the chairs stop spinning at Big Sky Resort and Moonlight Basin, tourist traffic slows, seasonal employees vanish, and locals travel. Big Sky becomes a mellow hideaway. Some associate off-season with desolation and chaotic weather, but it’s an incredible time of year. At Grizzly Outfitters, we pack up our ski rental fleet and set up our bike and fly shops. We mark down our winter gear and set up for summer. Locals hit the backcountry, or voyage to warmed climes to hike, bike, climb, surf, etc. I took my boys for a week of camping in Southern Utah. We biked the Slickrock Trail, jumped off hidden waterfalls, and climbed on the Swiss cheese rocks at the San Rafael Swell. It could not have been a more perfect getaway. Mother Nature has been treating us to wonderful weather since our return. We’ve gotten enough moisture to help the gardens grow, but enough sun to draw us outside. Right now, my purple hyacinths and daffodils are bursting. It’s time to rake the yard and check the sprinklers – but, I probably won’t (sorry neighbors). As you may know, Grizzly has a full-service fly shop and guide service. I’ve made it out for a couple floats on the legendary Yellowstone River. I stripped my first streamer, and caught my first decent Montana native cutthroat trout. Our guides are busy already, and it’s going to be a great summer. Stay tuned for gear reviews, casting clinic and demo information, as well as our area fishing report. Back in the shop, we’re geared up for summer. We’ve received most of our 2013 summer clothing and gear. Our buyers have picked out some gorgeous clothing, so keep an eye on our Facebook page to check them out. I got my bike tuned and have been hitting local trails to whip myself back into shape. The snow has melted from the lower elevation trails in Big Sky. To celebrate Mothers Day, I met up with a bunch of friends for a great early season ride up the Buck Ridge Road, and down the Doe Creek trail. It was a great ride and great company. On the ascent, we came upon grizzly bear tracks up the center of the trail. Remember, bear spray season is here, so don’t forget yours as you explore around Big Sky. Considering we had a group of 12, we forged on until we hit snow. The cruisy downhill was a blast, and the beers at The Corral were cold as usual. Our bike shop is up and running. We’re planning to bring back Grizzly’s weekly mountain bike ride, and some basic bike repair clinics. Have you ever used a chain tool on the trail? As you know (hopefully), Grizzly Outfitters has an expert boot fitting staff. We can also help you find the perfect fit for your summer footwear. Our state-of-the-art custom Amfit footbeds can also be used in slippers, sneakers, hiking boots, or almost any shoes you want to feel great. I put my extra pair in my roller skates. They’re performing incredibly. This morning, I went for a run and let the dogs splash in the river. When I was just about to head to the shop, Marc Lange (our magical bootfitter and bike repair geek) told me that our long-time rep from Kona Bikes was in town. I figured the only polite thing to do was join them on a bike ride. Trying to keep up with Kevin and Marc was a challenge, but the only way to get stronger is to ride, right? We laughed, we cried (not really), we talked bikes. I stumbled into an incredible day during off-season. A chill is in the air, in Big Sky, Montana. The hot summer of 2012 has given way to frosty mornings, but winter isn’t quite here yet. September is a glorious month. The chilly mornings turn into warm afternoons perfect for hiking, biking, fishing, golfing – whatever! The kids are back in school, the tourist season is slowing, and the trout are hungry again. Ahhhh, Montana. August was another hot and dry month overall. The Pine Creek and Millie Creek fires devastated their areas. Big Sky was relatively smoke-free, compared to the Bozeman area, but still suffered smoky days due to other fires burning to the west. Our thoughts are with those who were affected by the wildfires. The firefighters and others who help are true heroes. I avoided some of the smoke when returned to my birthplace in upstate New York. When I visit New York, I’m always surprised by the water that seems to hang in the air. The lush growth, hot nights, and cadent crickets make me feel like a kid again. But it also recalls memories of wet, cold, cloudy winters. The dry cold of a Montana seems friendly when compared to an ice storm. Yes, Big Sky has also spoiled me with its fluffy powder and blue bird days. I dearly miss my friends and family back east, but when it comes to skiing Big Sky, Montana is hard to beat. I guess it’s obvious I’ve been obsessing about ski season already! The new winter gear and clothing has been pouring in at Grizzly Outfitters. It makes it difficult to resist sneaking out of the office to try on clothes and bend skis. Of course, I do need to check out the merchandise for marketing purpose, right? Our customers near and far, need to know this information! I finally took the plunge and bought a jacket I have been eying for a while – The Patagonia Ultralight Down Jacket. It’s a great all-around piece, great for layering or on its own. It’s filled with just the right amount of premium 800-fill goose down to make it a useful coat in warmer temperatures. The shell is a special edition nylon that is half the weight and twice as strong as Patagonia’s other down fabrics! It will fit perfectly under my ski jacket! I know, I know, I am jumping the gun as far as ski season is concerned. September is my secret favorite month of “summer” here in Big Sky. The days are delightful and the perfect temperature for getting active outdoors. The nights are cool and perfect for campfires, hot tubs and sleeping. The aspens are turning gold, and the willows into their autumn wine color. The smell of wood stoves burning lingers in the night air. A bear swats my grill of the back deck, and a mother moose tries to trample my dog. Ahhhh, Big Sky. I love this place. The stars shine brightly here in Big Sky, Montana. Late Saturday night, I was lucky enough to enjoy a brilliant natural display, the Perseid meteor shower. Relaxing in the hot tub, I zoned out and watched dozens of meteors streak across the sky. Some were just simple lines of light, others thick and sparkly. 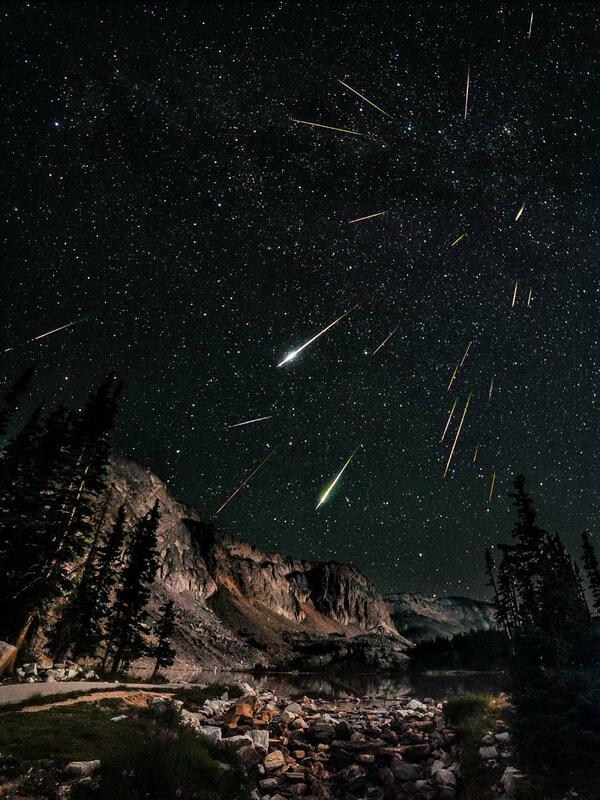 The Perseid meteor shower is named for the constellation (Perseus) from which the falling meteors seem to originate. The shower happens when earth’s orbit moves through a cloud of debris left by the Swift-Tuttle comet. Check out this composite of 23 images taken by David Kingham in the Snowy Range of Utah. It’s been a hot and gorgeous summer in Montana! But hot + dry = wildfires. Luckily we have avoided the burn around Big Sky, and hope to keep it that way. On the up side, drifting smoke from far-off wild fires dyes the sunsets and sunrises. Monday morning’s sunrise was glaring neon pink. Over the weekend, we enjoyed (that’s right, enjoyed) some rain and cooler temperatures. Today, our blue bird Montana sky is back. Grizzly Outfitters is excited to have a tenkara fly-fishing gear from Tenkara USA. Tenkara is the traditional Japanese method of fly-fishing that is ideal for mountain streams. The angler uses only a rod, line, and a few flies – no reel. Tenkara is about fly-fishing simplicity and mountain-stream effectiveness, though the rods can be used anywhere. Watch this video featuring Tenkara USA founder Daniel Galhardo playing a 20” brown on the nearby Madison River. The boxes of fall and winter gear are rolling in. Stop in to check out the newest gear and clothing from all of your favorite brands – what do you want to try on? Select clothing/gear is also on SALE now!!! In Big Sky, summer is finally upon us. The snow falling in early June has given way to deep azure skies and warmer weather. We’re thought of as a winter destination, but summertime in Big Sky in unparallelled. There are so many activities from hiking to zip-lining. Mountain bike out your back door. Fish the country’s most iconic rivers. Enjoy a horseback ride or cowboy cookout with Cache Creek Outfitters. This summer, Big Sky Resort will offer rides to the top of Lone Peak via the tram! Disc golf, skateboard, shoot hoops, or play on the swings at one of the most scenic community parks in existence. Dig for crystals and fossils. White water raft or try rock climbing. It’s all right here in Big Sky. Day trips to Yellowstone National Park are a piece of cake, and you avoid the swarm of tourists. Yes, Big Sky is a secret summertime jewel here in the Treasure State! This time of year, I am usually still getting my legs under me for mountain biking. Big Sky has great trails for everyone – from first timers to experts. Lots have easy warm ups on roads and cruisy single track finishes. This year I am making an effort to really learn how to fly fish. I’ve dabbled in it for years – first back in the Adirondacks of upstate New York, and now here. As a younger person, I thought of it as a little boring, but considering it involved water and friends (and sometimes beer), I went anyway. I depended on friends to help and never really caught anything. I caught my first trout on a fly rod in late May on the Gallatin. It was snowing and the fish was little, but it was a complete thrill! The rush of catching a beautiful (even little) fish is immense, and I was hooked (ha ha ha). Anyway, this summer I am lucky enough to have award winning, world-class guides right here Grizzly Outfitters. They’ve been helping me to become an independent fly fisher woman, so thanks guys! Mountain biking is still my first love, but it always takes a few rides to regain my concentration and balance. “Drunk Driving” the the phenomenon when a biker wobbles their front tire around in an attempt to balance. This is the stage I am at right now:) My biking season started late, but it will all come together sooner or later! Speaking of which, we are trying to organize the return of the Grizzly Ride. For years, we had a group ride for bikers of all levels. Stop into the expanded bike shop or drop us a line via Facebook and let us know you are interested. Right now, we are considering a Tuesday morning ride. What works for you? We have some other exciting events planned for summer…..so stay tuned. Hope your day has been beautiful! Return of the Blog - 100% Blister-Free! It’s offseason here in Big Sky. The G.O. crew has been hard at work setting up for a stellar summer season. We have all kinds of new and exciting merchandise for your outdoor pursuits. We are psyched to be carrying award-winning footwear from Salewa. As a company, Salewa is best known for it’s backpacking, climbing, and mountaineering equipment. It has created a line of approach and running shoes offering a 100% Blister free guarantee. The highlight of the fit system is an anatomically positioned cable that achieves perfect heel retention, which Salewa explains is crucial in blister prevention. Shoes also come with a “Multi-Fit Footbed” which easily adjusts to suit higher or lower-volume feet. Salewa footwear boasts great flexibility while retaining stability. Drawing on climbing shoes as inspiration, laces extend down to the toes for the best fit. Salewa also drew on its climbing/mountaineering past to develop unique designs that save weight and preserve durability. The line utilizes the industry’s best materials, including Vibram rubbers, Kevlar, and Gore-tex (depending on the model). The result is a line of footwear suitable for a professional mountaineer, a part-time trail runner, and every athlete in between. Here at Grizzly Outfitters, we are carrying: the Alp Trainer Mid GTX, M’s Fire Vent, W’s Firetail, and M’s MTN Trainer. Other styles are available by special order. Check out some pics from our Salewa rep’s recent visit to Grizzly Outfitters. Thanks to Brandon, and to G.O.’s own Kelly and Lucy for showing off the Salewas! Not a bad-looking bunch of folks. Our Spring Meltdown Sale continues! After a fun weekend here at Griz, Ken & Andrew have decided to keep the sale rolling. Winter clothing, last year’s spring/summer clothing, and gloves will remain at 50% OFF! Most skis, poles, and helmets will continue to be 30% OFF, and we have assorted sale bins throughout the store. We’re supposed to get a nice hit of pow in the next couple days, so treat yourself and SAVE. Thanks to everyone who came out for the “Spring in the Backcountry” event. We had Alex B. of Big Sky Resort Ski Patrol bring his avy dog, Charlie. The Friends of the Gallatin National Forest Avalanche Center sent Alex M. to hold a beacon practice clinic. Both were super fun and informative! We hope to hold a similar beacon clinic during the 2012-13 winter season, so stay tuned. The store is flooded with NEW Spring inventory from all of our vendors. This spring we are pleased to add Carve Designs and Chico Bags to our list of vendors. Interested in more DEALS? Like us on Facebook, or email amy@grizzlyoutfitters.com to be added to our “Friends of the Shop” list and receive exclusive deals and sale information. Ha, it snowed. Nine inches on Lone Peak! I’m sure this was disappointing to many folks who have been lusting for spring, but too bad. It was beautiful. The snow clung to every tree and shone in the sunlight. I realize that the 2011-12 ski season was not the most powdery ever to hit SW Montana. Big Sky still fared better than many areas, and I enjoyed a healthy amount of faceshots this winter (…..and I don’t mean the house shot at the Lotus Pad, which are also delicious). It’s interesting to look at the inches of precipitation for each month versus the snowfall in inches. This is also known as the Snow Water Equivalent (SWE), which is the amount of water contained within the snowpack. An easy way to think about it is that it is the amount of water you would end up with if you instantly melted the snow. Obviously, deeper snow with less water = fluffier POW! That’s the technical explanation. Please take the time to LIKE us on Facebook! Then, feel free to tell me how how wonderful or poorly written and boring this blog is. Next, suggest subject matter that you would find appealing/interesting. We love you guys after all! Winter storm warning tonight and tomorrow. Winter storm warning tonight and tomorrow for Big Sky. Looks like Winter may be back for a few days – snow and cooler temperatures.